This lease agreement is designed for a transaction in which the landlord leases an entire underground parking garage (plus adjacent surface parking) to a tenant that has leased all or substantially all of the office space in an adjacent building owned by the landlord. The rent for the garage is calculated by multiplying the number of parking spaces in the garage by a per space rate set by the landlord when the lease is signed. The landlord has the right to adjust the per space rate once each year. In consideration of the obligations of Tenant to pay rent and other charges as provided in this Lease and in consideration of the other terms, covenants and conditions of this Lease, Landlord hereby leases to Tenant and Tenant hereby leases from Landlord the premises described in this Lease for the term and subject to the terms and conditions set forth in this Lease. 1. LEASE. Landlord leases to Tenant the exclusive use of the entire underground parking garage outlined on the floor plan attached as EXHIBIT A-1 ("Garage") being a portion of the building located at _____________ ("Building"), which constitutes a portion of the real property legally described in EXHIBIT B ("Property"); provided, however, Landlord shall retain the exclusive use of _______ (__) regular sized parking spaces in the Garage ("Landlord's Spaces") to be designated by Landlord from time to time together with non-exclusive ingress and egress to and from the Garage for access to Landlord's Spaces. Landlord's Spaces initially designated by Landlord are shown on EXHIBIT A-1. Landlord may use Landlord's Spaces for Landlord's use or to lease to others. Landlord also leases to Tenant the exclusive use of the parking spaces and the non-exclusive use of the drive aisles located in that portion of the outside parking area outlined on the site plan attached as EXHIBIT A-2 ("Outside Parking Area") being on and/or in the vicinity of the Property. The Garage and Outside Parking Area are collectively referred to in this Lease as the "Leased Parking Area." References to the Garage shall be deemed to be exclusive of Landlord's Spaces unless the context requires otherwise. Landlord shall provide to Tenant, on or before the commencement date of this Lease, one remote opener device ("Opener Device") for each parking stall in the Garage portion of the Leased Parking Area. Additional Opener Devices desired by Tenant at the beginning of this Lease shall be available at a cost of fifty dollars ($_______) each. 2. TERM. The term of this Lease shall commence and terminate on the same days as the commencement and termination (by expiration of the term or earlier termination) of the term (as it may be extended) of the __________________ Lease Agreement of even date between Landlord and Tenant for the lease of the _____________________ floors of the Building ("Office Lease"). During the term of this Lease, Tenant shall have use of the Garage 24 hours per day, seven days per week, and use of the Outside Parking Area from 6:00 a.m. to 6:00 p.m. Monday through Friday; provided, however, there shall be no admission of automotive vehicles to the Outside Parking Area after 5:00 p.m. Tenant shall have no duty to pay rent until the Commencement Date as defined in the Office Lease. 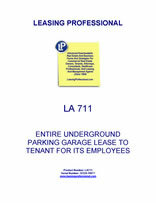 In the event of a partial termination of the Office Lease (i.e., termination of the Office Lease with respect to less than all of the premises leased under the Office Lease), then Landlord reserves the right to terminate this Lease with respect to a proportionate portion of the Leased Parking Area in both the Garage and Outside Parking Area. 3.1 Tenant shall pay monthly rent ("Rent") to Landlord for the Leased Parking Area on the first day of each month during the term of this Lease. At Landlord's request, Tenant shall pay all Rent due under this Lease by direct deposit to such account as Landlord may designate from time to time. In the event that the first day of the term of this Lease is other than the first day of a calendar month, the rent for the initial partial month shall be prorated accordingly and shall be due and payable on the first day of the term of this Lease. 3.2 The Rent shall be equal to the product of the number of parking spaces located in the Leased Parking Area multiplied by the prevailing market rate for the monthly rental of such parking spaces on an individual basis. Landlord and Tenant agree that, as of the date of execution of this Lease, the prevailing market rate for the monthly rental of the parking spaces in the Garage is $___ per month and the prevailing market rate for the monthly rental of the parking spaces in the Outside Parking Area is $___ per month. The initial Rent shall therefore be $______ per month (___ spaces in the Garage @ $___/month plus ___ spaces in the Outside Parking Area @ $___/month). 3.3 Landlord may adjust the Rent no more frequently than once in any calendar year to reflect the prevailing market rate for the monthly rental of the parking spaces located in the Leased Parking Area. Landlord shall provide at least thirty (30) days written notice to Tenant of the amount and effective date of any such Rent adjustment. There shall be no Rent adjustment during the first Lease Year of the Office Lease (as defined in the Office Lease). 3.4 Should any governmental taxing authority acting under any present or future law, ordinance or regulation levy, assess or impose a tax, excise or assessment (other than an income or franchise tax) upon or against or measured by rent, or any part of it, Tenant shall pay such tax, excise and/or assessment when due or shall on demand reimburse Landlord for the amount thereof, as the case may be. 3.5 Tenant shall deposit with Landlord ________ dollars ($______) for each Opener Device upon receipt (except for Opener Devices purchased by Tenant under this Lease). The deposit shall secure the return of each Opener Device to Landlord in good condition, ordinary wear and tear excepted. If Landlord sells or otherwise transfers the Property, Landlord may transfer the deposit(s) to the purchaser and Tenant shall look solely to such purchaser for return of the deposit(s) and Landlord shall be released from all liability and obligations under this Lease arising out of any act, occurrence or omission relating to the Leased Parking Area or this Lease occurring after such sale or transfer. Landlord may commingle all deposits with other funds of Landlord. Landlord shall refund to Tenant any unapplied portion of the deposit with respect to each Opener Device, without interest, within thirty (30) days after return to Landlord of such Opener Device in accordance with the terms of this Lease.